Welcome one and all to another edition of Mastication Monologues! Winter has finally hit Chitown harder than a raging Ditka and has been making life miserable for most aside from snow plow drivers and snowblower vendors. 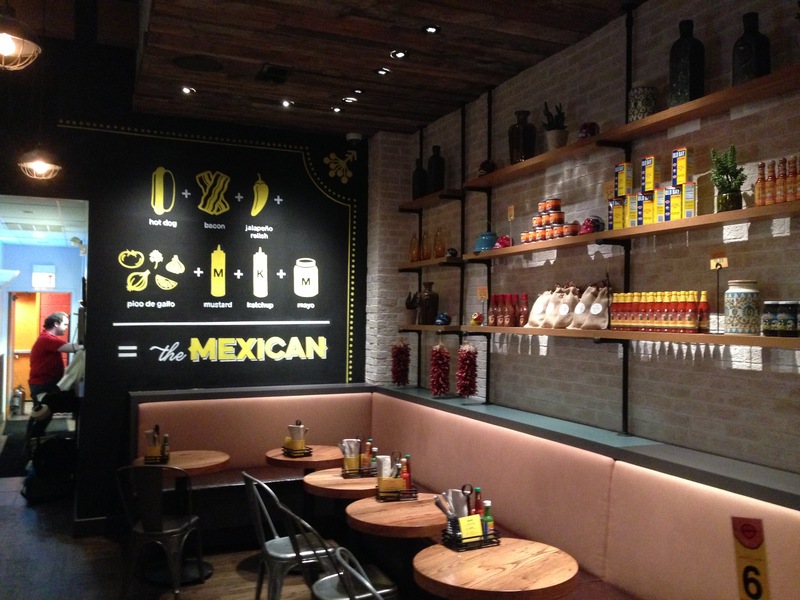 However, if you’re looking for a warm and inviting restaurant in Chicago that serves up Mexican food with a twist, check out Mercadito Counter. Now, this post is super late since I went back in the late summer/fall, but I hope that not much has changed in this funky fresh eatery. 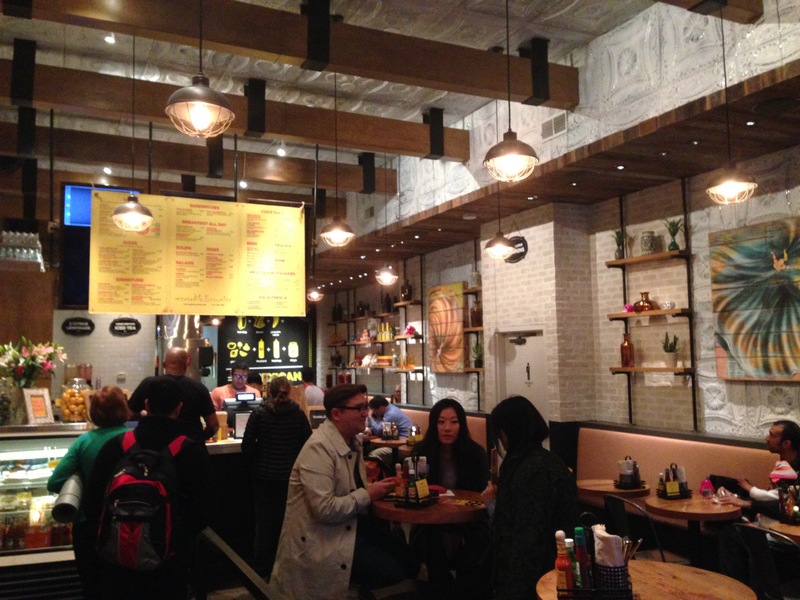 From the instant you walk in under the papel picado, you’re transported to a modern taqueria whose menu boasts everything from tacos to Mexican hot dogs (more to follow). Speaking of the former Mexican staple, Mercadito Counter boasts a taco eating challenge where a diner has to eat 35 tacos in an hour. If you gobble all of them up, you get free tacos for life but only on Tuesdays. Naturally, there’s a catch! After agonizing over the menu for a good ten minutes, I decided to get a steak taco, a pork taco, and The Mexican hot dog, and a Nutty Mexican milkshake. 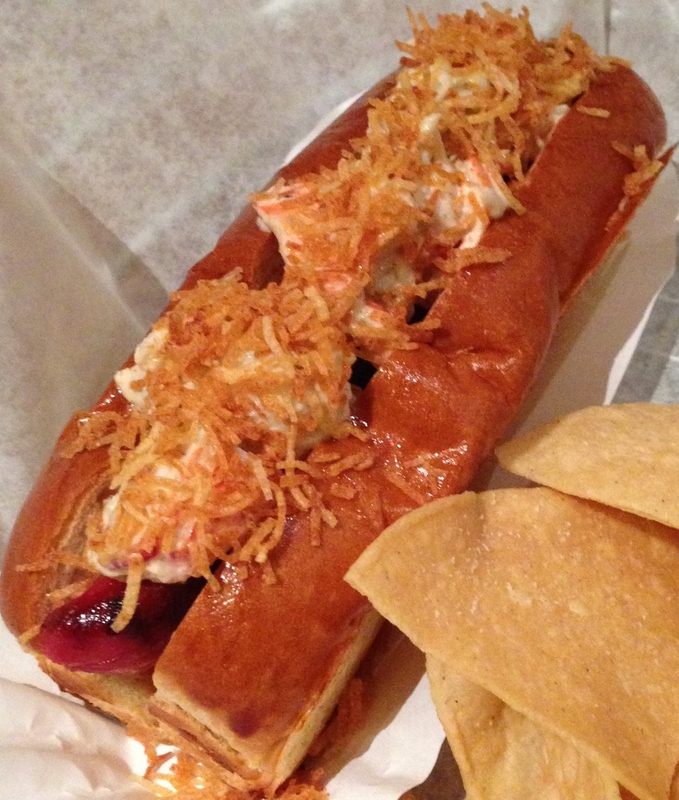 Janice got an order of onion rings, a fundido hot dog, and a lobster dog. While waiting for our grub to arrive, we got some of the locally made salsas that were in squeeze bottles behind where we ordered our food. Eventually, it all came out and looked fantastic. I started with my tacos. While they were immaculately presented, their size left much to be desired based on their price (roughly 3 bucks a taco). Ay Chihuahua! 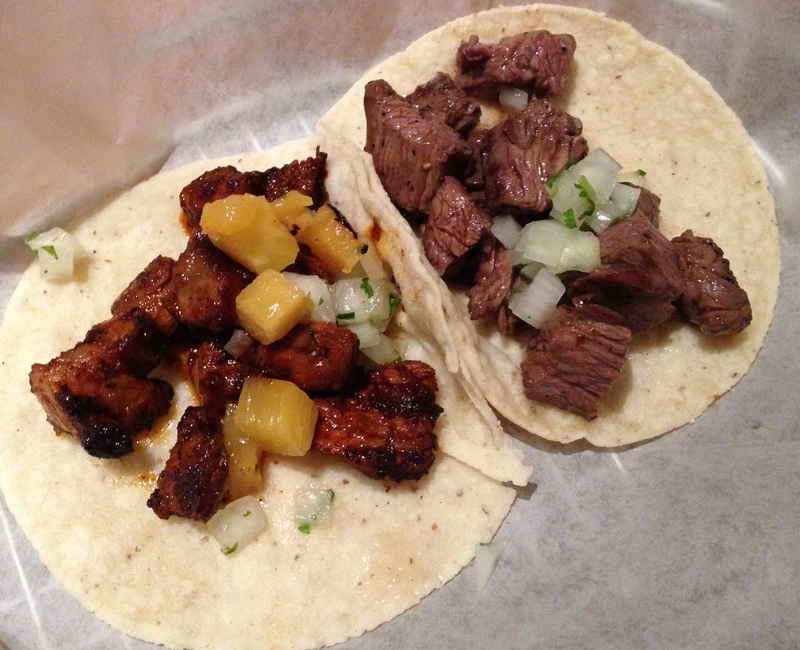 Surprisingly, the steak taco was a lot more flavorful than the pork taco even though the latter had roasted pineapple chunks as a sweet caress to the ancho and guajillo slathered spicy pork. I think I enjoyed it more because the meat itself wasn’t drowned out with lots of strong flavors, and the key lime marinade was a stroke of genius. As for my Mexican hot dog, it was my best friend. 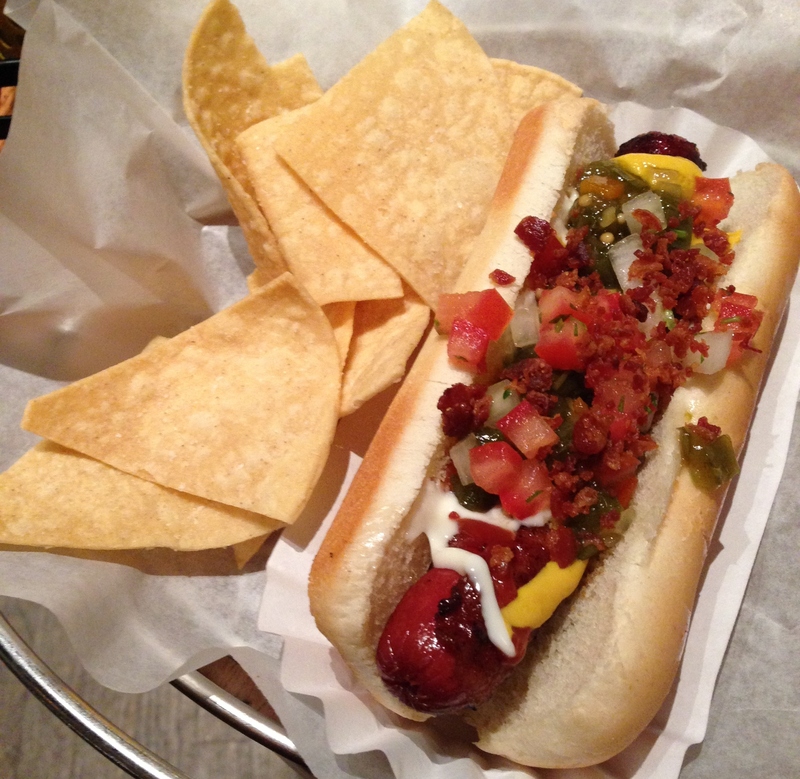 It consisted of a grilled, bacon-wrapped dog covered with pico de gallo, mayo, jalapeño relish, mustard, and ketchup. It was an excellent example of literal Mexican American cooking where the zesty pico de gallo and jalapeño relish provided a Latino slant to the more classic flavors, and the bacon strip gave the char dog a satisfying, porky crunch with each bite. 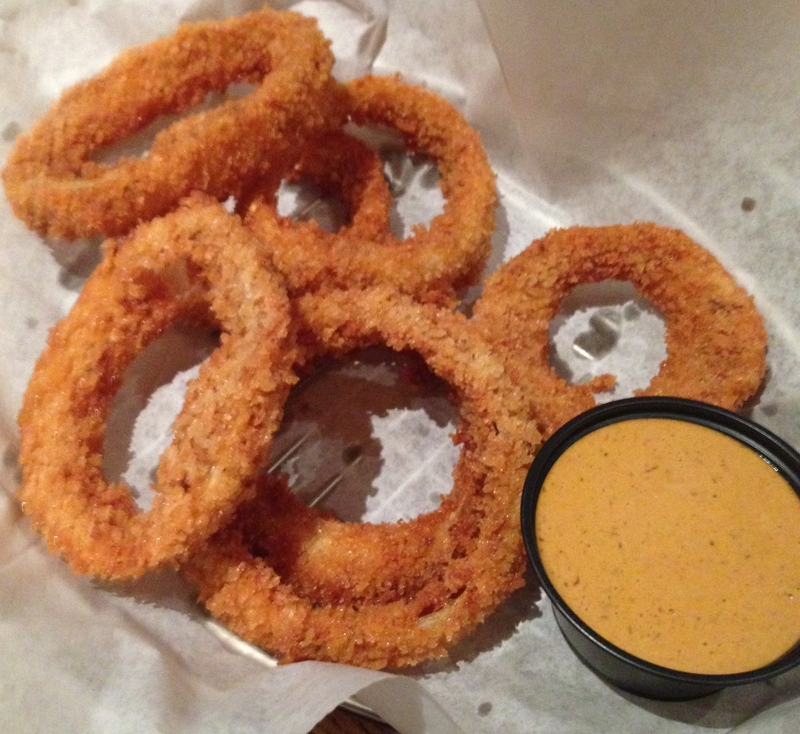 Between bites of my food, I sampled Janice’s onion rings which were delicious since they were crunchy, large, and didn’t succumb to severe onion loss that I hate when eating the greasy bar food staples. What is severe onion loss? It’s the annoying phenomenon when biting into an onion ring only to have the entire veggie slip out leaving you behind with a crunchy shell. First world problems, I know. 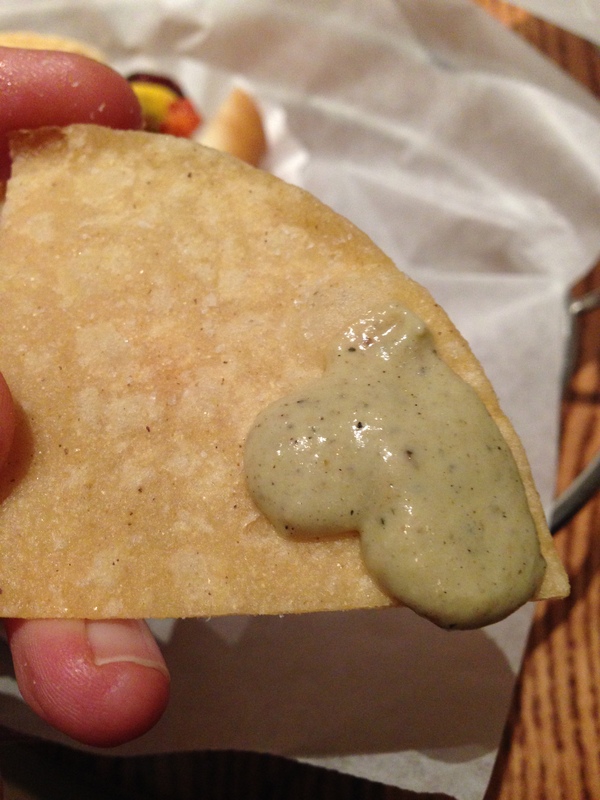 I did enjoy the chipotle dip that came on the side that gave this appetizer the south-of-the-border kick it needed. 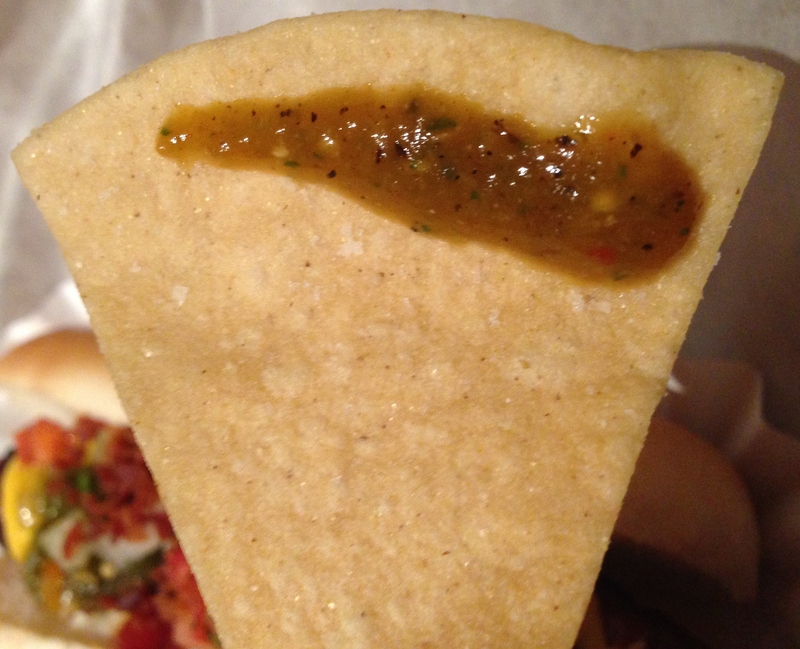 We also used the homemade salsas on the complimentary tortilla chips that came with our hot dogs. 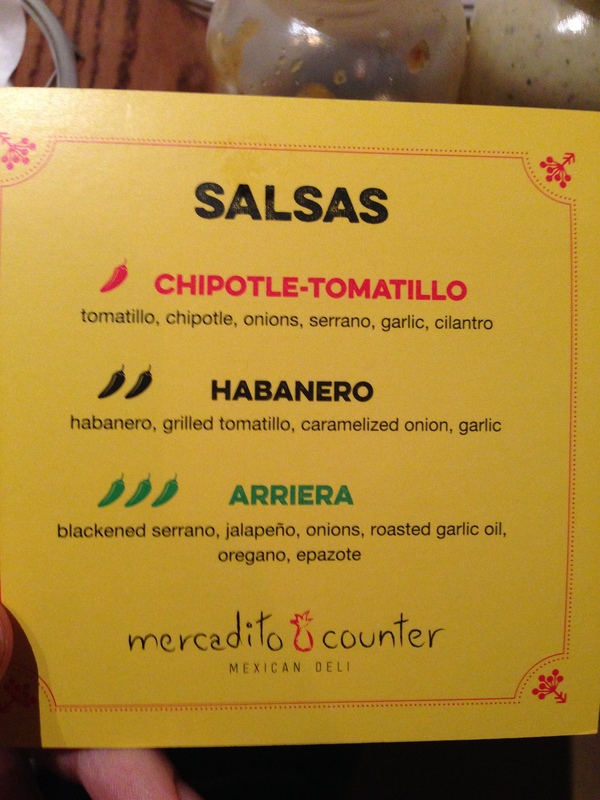 There were three different types: the chipotle tomatillo, the habanero, and the arriera. 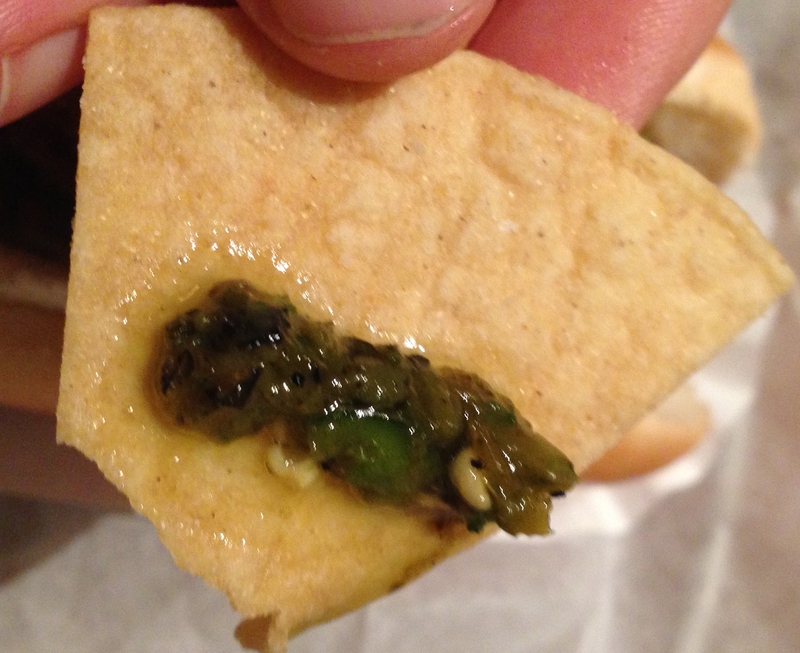 The chipotle tomatillo was more like a common green salsa that could be found in most Mexican restaurants where there was a lot of tomato flavor with sparks of garlic and cilantro. My favorite was the arriera since it was surprisingly spicier than the habanero salsa. Plus, it had epazote or wormseed in it which is a herb that can poisonous in large quantities, but in small portions it alleviates gas and discomfort during digestion. So it was a win-win especially since we were eating Mexican food. I also took a bite of Janice’s fundido dawg that was good but not great. 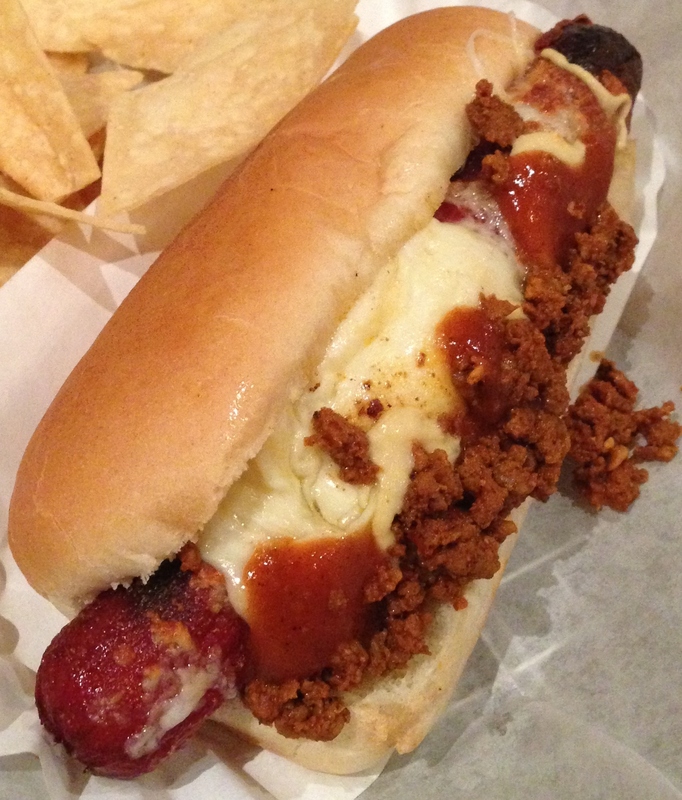 It was basically a Mexican twist on a chili dog with chorizo instead of ground beef on top. I didn’t take a taste of her lobster dog, but she said it was delicious and decadence embodied. 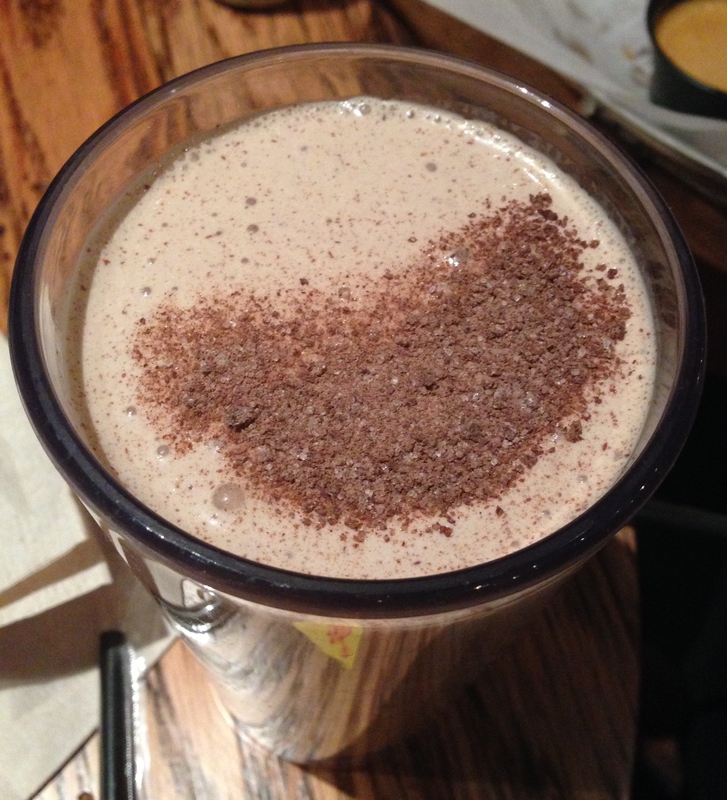 Speaking of super scrumptious items on the menu, the Nutty Mexican milkshake I had was mind-blowing. 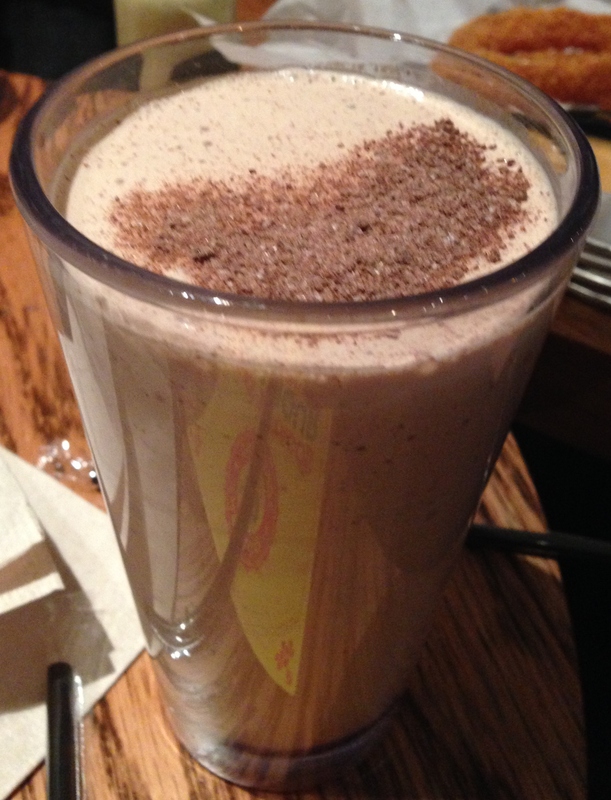 From the powdered cocoa powder on top along with a mix of nutmeg and cinnamon blended throughout the milk chocolate ice cream. All of which left me filled up but not ready to explode like una bomba. So if you want to check out Mercadito Counter, I’d recommend a visit, but I would get the hot dogs over the tacos since they aren’t as big of a rip off in terms of the price vs. size ratio. Inflated prices aside, the fresh ingredients, service, and flavors made this taqueria tops for the area! 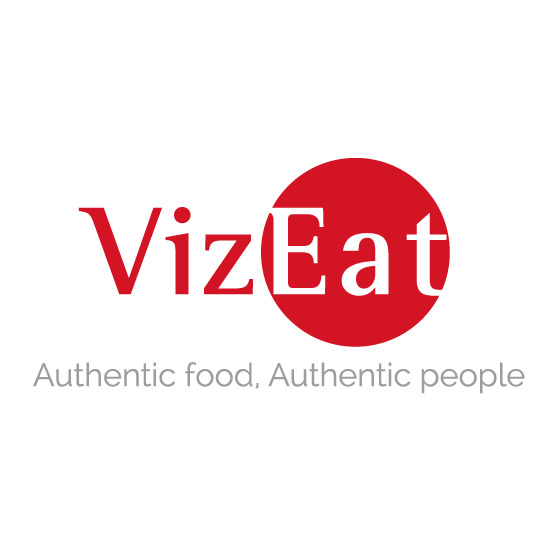 Posted in Latin American Cuisine, Mexico and tagged bacon, Chicago, Food, fried, hot dog, ketchup, latin, mayo, mustard, pico de gallo, restaurant, Reviews, salsa. Bookmark the permalink.